The above photo is NOT mine but used as reference to the idea behind the project. 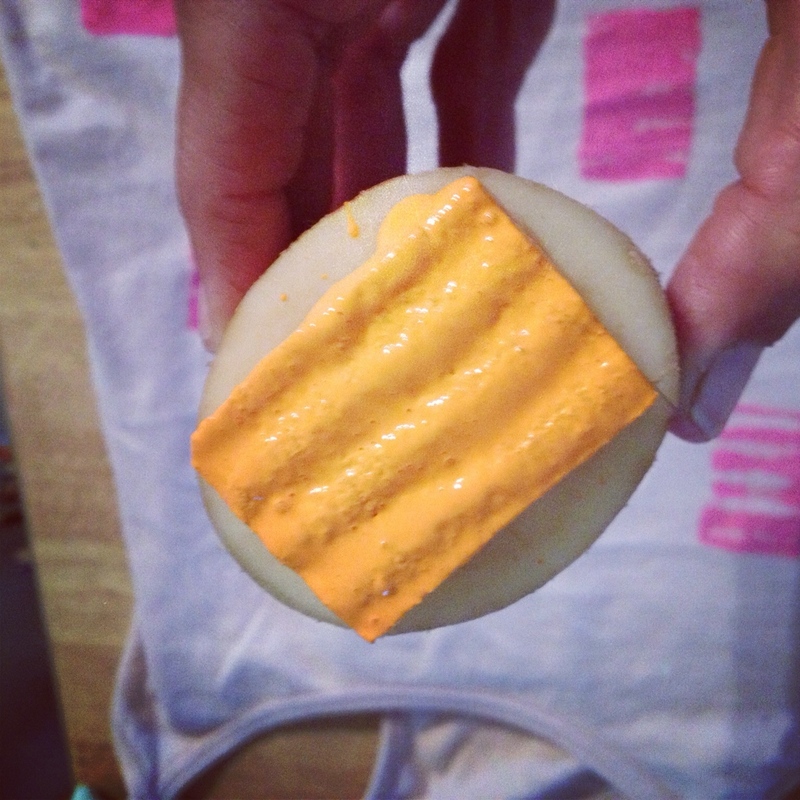 This idea was not mine but, is my own version of the ever popular DIY creative, Lexy Ward via The Proper Pinwheel. Please follow all of Lexy’s social media networks to see more of her genuinely unique creations Facebook, Pinterest, Twitter, Tumblr; but most important Subscribe! 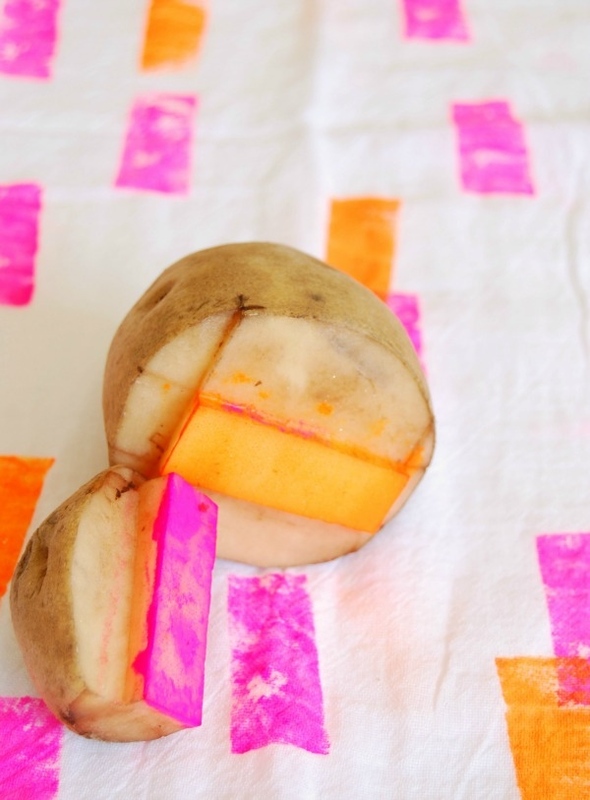 The inspiration for my post here was her Potato Stamp Neon Napkins DIY. If this project doesn’t interest you, Lexy B Ward projects can also be seen on the best DIY community on Curbly.com! OK, Now its time to talk about ME lol! As promised, I have much new fruitful learnings to share with my fellows here, from the many adventures throughout our “lovely” Summer experiences! Like I say, “Onward and Upward”! As you all know I am convinced in some delirious part of my brain, that I can complete a DIY! In fact, I have semi-completed 1 so far. The painting and gluing will be the last steps to the (DIY towel rack) completion. In the meantime, I have also added to the mix a few more pieces of DIY inspiration for our new white walls/blank canvas, in our (rental) apartment we have at our decor disposal now. I myself am almost frightened of what I will do or think of next. And, that fact, has got me thinking alot more lately…I have always had a fear of completion. I dont know where it stems from. When I was a full blown alcoholic/addict, I had never completed any thing in my life, from start to finish. Not Once. Besides grades 1 through 11. Even my University career has been shortlived or started and not finished; ever. Tried twice already, and I am soon on my third; so I’d better figure this out FAST! TEEN’s own University career is up for discussion as of late and I’m feeling inadequate for advice or inspiration, never having completed my own. Of course, its for one reason or another. It’s never that I’d set out to start something and not finish–it’s just seemed to always turn out that way. Told you I learned alot from our experiences this summer. About me, my children, my family, friends, neighbours and beliefs. There’s a few things I am working on inside. I have much more to share but, lets talk swag decor now (lol! swag). I chose this crinkle-cut slicer to create a unique characteristic in our DIY (to be different from the original idea as well); hopingto give a wavy sort of look on the paint. aww … our first stamp – nail biting! LO was so excited to wear her shorts I don’t know how I managed to get her to sleep. Next day we both decided to show off our home DIY ‘fashion designs’ together! I love watching LOs posture just rise three-feet higher as she prances into school, announcing her creation to impressed teachers and classmates. With her developmental delays LO doesn’t have many other children understand or approach her for play. I encourage her creativity to offer her a way to introduce herself and add more verbal communication between her and her fellows (at daycare/”school”). Unfortunately, LO wouldn’t stay still for a photo of her shorts. They all appear too blurry to post. Now, remember I am no photo genius or no DIY genius! The next shots were fun in the moment try-ons and non-professional. Oppsie! 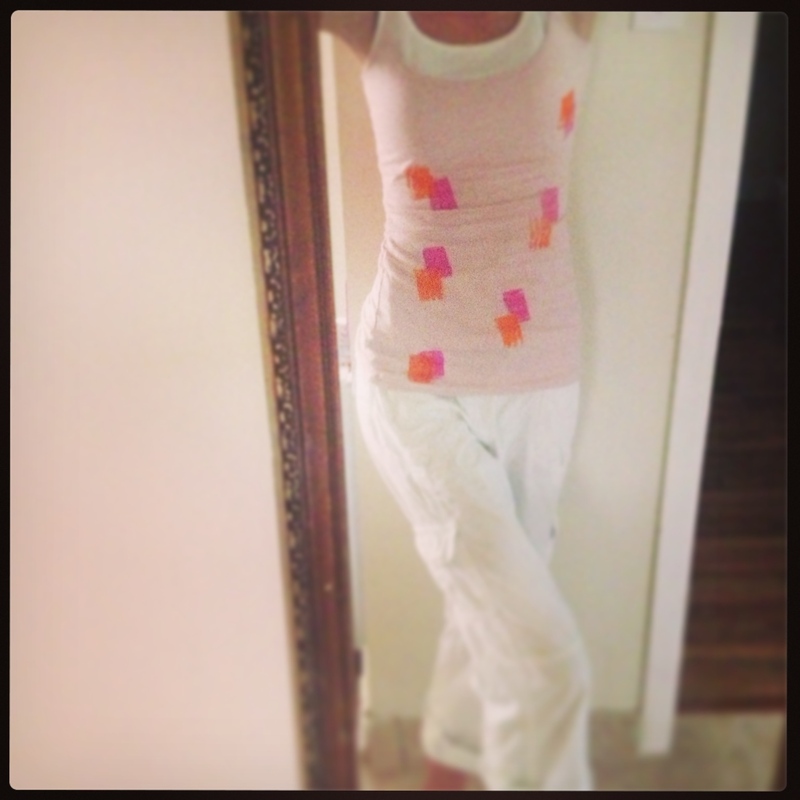 NO I am NOT pregnant, although this photo makes it look like I am from a distance! Definitely no chance of pregnancy with this blogger…last photo is my favorite. The back of my tank top turned out much better than the front; probably because I did the back last. Next time I will learn the mistakes that way. completed project #1 ;) We actually got compliments all day about our clothes! Remember, This is just one of the projects I have started around the house. PLEASE, I welcome the push to see me complete and POST my projects! I’d love to hear your colour recommendations, or different ideas and inspirations you’d like to share with me. Consider me your DIY Ginea Pig: If I have the tools, I will try it! Leave behind a link to ANY DIY projects you’ve posted completed or started LOL around the house; you know, so I know Im not alone in learning how to FINISH things! As I have said in the past, if you like my photos and wish to use them, just ask or drop me a line of the content it’s been featured in, thanks. Remember, these are my family time photos and I expect them to be shared in the same manner. I don’t usually start a DIY unless I know I can complete it right away, otherwise I will not be able to sleep thinking about it LOL. I love how the shirt design turned out! Thank you hunny–Did our best & I enjoyed it! I am still having a very hard time completing another! I cannot find the right excuse as to why I haven’t started another one that Im so dying to try: i Think Im too worried about failing and having the piece look horrid in our home LOL… So I’m not doing it at all! OK, Im working on pushing myself to do tomorrow! First, congratulations on your eight years! Second, this is really cool. 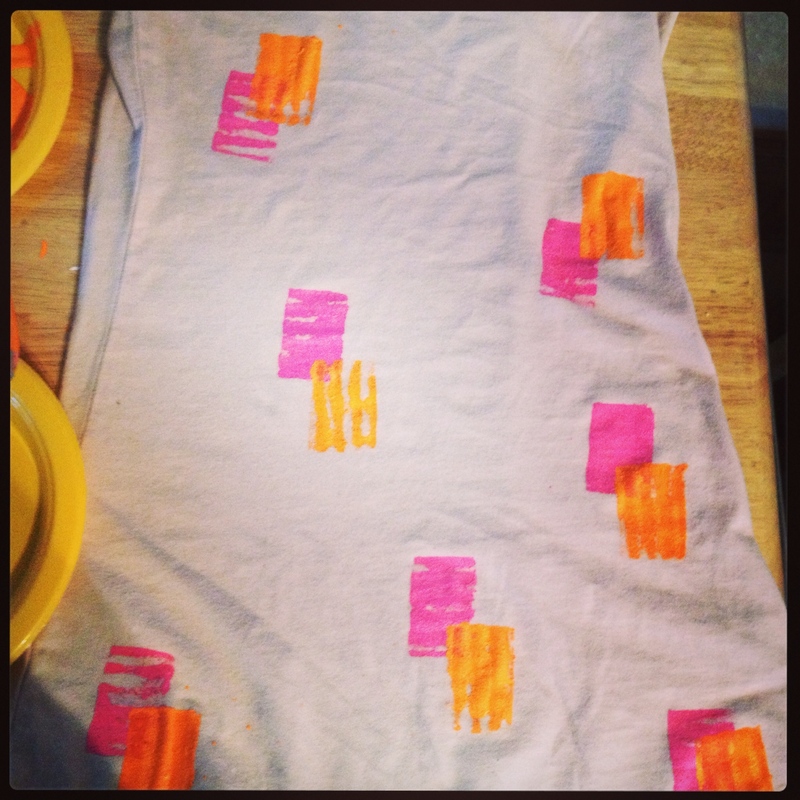 I’ve done something like this with the kids at work for an art project using different kinds of veggies and fruits, but on paper…neat idea for on clothes! Great job! I love it! Great project! Looks super cool!!! I love the outcome. Big ups to you and never forget to share it when its drippin swagoo like this one. LMAO I luv u girl!! lmao! I am so sorry in advance as I my dear, am no leader in this line of work lol! Youre better to follow the kids at the closest elementary school for guidance lol! But, I sure do get an A for effort right ;) Thank for stopping by! I gotta check up on you more often. Lmao! Elementary school it is.